CHERUBS family get together April 27, 2019, in Fredericksburg, Texas. 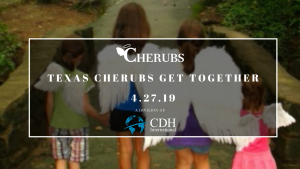 We will have lunch and get to meet some fellow CDH families! The park where we will meet up has playgrounds, fishing, hiking trails, and sports courts. Bring any outdoor activity your family may enjoy (balls, frisbees, etc.) Hot dogs and brats and beverages will be provided, please bring a side dish or dessert to share. We will be meeting at Lady Bird Johnson Municipal Park, Lady Bird Dr, Fredericksburg, TX 78624 – Pavillion #4.